What Does the P0405 Code Mean? The P0405 code indicates some problem with the Exhaust Gas Recirculation system. It is triggered when the PCM does not detect a certain degree of change in the manifold air pressure as the EGR valve activates. In some cars, several drive cycles are required before the trouble code triggers while in some vehicles the “check engine light” illuminates as soon as the first indication of a change in the rate of flow of exhaust gas recirculation is received. 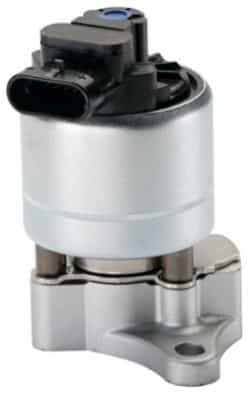 Modern vehicles also use an EGR position sensor that monitors the opening and closing position of the EGR valve. The information from the EGR position sensor is sent to the PCM which then decides the flow of exhaust gasses depending on how much the EGR valve opens. If the PCM calculation does not match with the data transmitted by the sensor, the P0405 code triggers. The check engine light illuminates as soon as the PCM reading does not match with the function of the EGR valve. If there is an issue with the voltage, the ECM may open the EGR valve more than required causing the engine to hesitate or the acceleration to drop. If the ECM does not receive correct information from the EGR position sensor, the EGR valve position will not be properly determined causing the engine to deliver rough performance. How to Diagnose the P0405 Code? Since the P0405 code denotes a circuit problem, you would need a specific EWD (electric vehicle diagram) according to your vehicle model as well as a (DMM) digital multimeter to diagnose the trouble code. Whenever you are doing a troubleshooting procedure on your car, especially with the ignition on, there is a high risk that the car’s battery will drain out. Moreover, with low voltage, your car will display additional trouble codes making things more complicated. Which is why it is necessary to connect a car battery charger at all times whenever you are fixing a problem in the car. An OBD2 Scanner is an excellent device that reads the information regarding the trouble codes. Most modern scanners have base values set in them which allow you to check the reading of certain components and comparing them to see if a replacement is necessary. You can easily inspect and check EGR functions through the scanner. A multimeter can also be used but most experts recommend an OBD2 scanner. The first step is to check wire connections and look for damage or burns which can result in circuit problems. Also, make sure to check for possible water damage or bent and broken pins. A traditional and most common EGR position sensor is a three pin type with a reference voltage, Ground, and Signal. If the EGR valve in your car is vacuum actuated, perform the bench-test of the position sensor using a vacuum pump and a DMM. Remove the connector and measure the resistance across the whole circuit and the reading should be around 6 kΩ. Next, take the reading on the signal wire by measuring between the VC and EGLS pins and it should read somewhere between 0.1 kΩ and 5.5 kΩ depending on the amount of vacuum you apply. If the reading on E2 is 5 V, you will notice the same reading on EGLS as well indicating that you have an open circuit. If the reading on VC and EGLS measures 5 V but 0 V on E2, there could be an internal or external short circuit. In that case, you should check the resistance between VC and EGLS. If it is less than 100 Ω, then there is a short circuit and the sensor needs to be replaced. If the resistance measures between 100 Ω and 5,500 Ω then there is a short circuit in the wires. However, if the reading shows 0 V on E2 and 4.5 V on EGLS, then the sensor is damaged and needs replacement. The P0405 code is most often caused by issues with the EGR (Exhaust Gas Recirculation) and can be fixed easily. If you find anything confusing within the above article or have additional questions, just comment below and I will get back to you as soon as possible.